I went back to my house on Wednesday for the first time since I handed over the keys to the builder and escaped to my brother’s beach house two weeks ago. It’s just as well that I’m project managing from afar. There’s no way I could have worked from a building site with no bathroom or workable kitchen and where every available space is stacked with furniture or soon-to-be-installed bathroom fittings. In fact, there’s not much room to swing a proverbial cat, let alone play ball with Bertie dog. 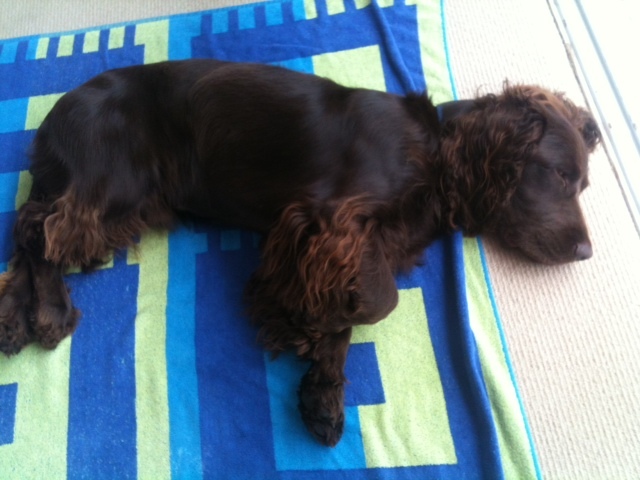 Incidentally, he turns one in two weeks’ time which means he is no longer a puppy but a juvenile. And a naughty one at that! I left him in the kitchen this morning while I showered, and within ten minutes he had pinched the towel off the rail, pulled down the rubber gloves from the sink and was tucking into a packed of bread. Anyway, back to the renovations. “You’ve no idea what’s been going on,” said my long-suffering neighbour. He wasn’t complaining – well not directly anyway – just pointing out that there’d been trucks going up and down the driveway, lots of noise, disruption, bashing, breaking, splitting, dragging, scraping – the whole shebang. I asked him if he’d had a look round – would he like a tour of the rotten bathroom floor and wood borer infestation? And did he know they’d found asbestos in the bathroom? No, but he would willingly swap places with me in my coastal hideaway, he said, somewhat wistfully. I’m happy to say the asbestos has been taken away – at a price – of course. Rule number one of home renovations is that they always go over budget. So you have to budget to go over budget and a bit more. 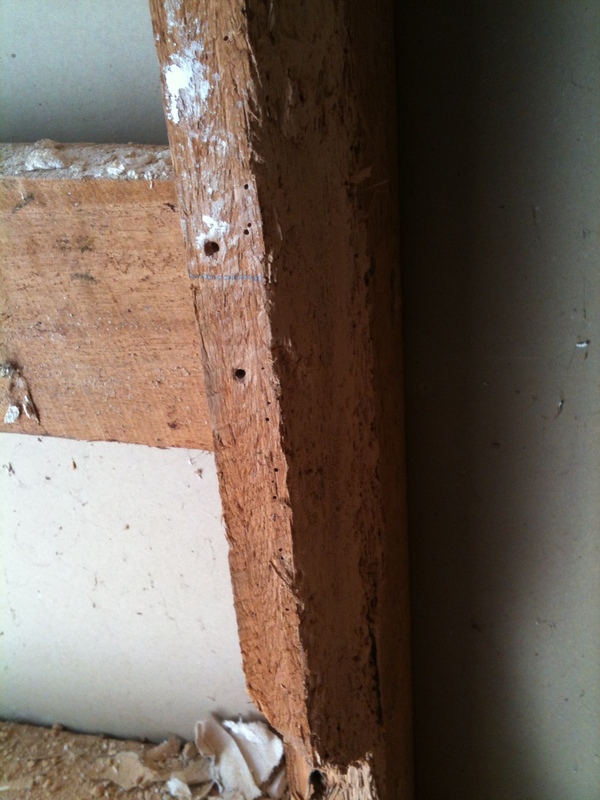 But at least I haven’t got to strip off all the plaster and get the wood borer treated. For all of half a day, I thought we might have to knock down the house and start again. My builder called in a specialist and, as far as I understand it, wood borer attack freshly cut timber (is that the same thing as sapwood?!) but do not re-infest dry timber. So whatever damage is done is done and won’t get any worse. 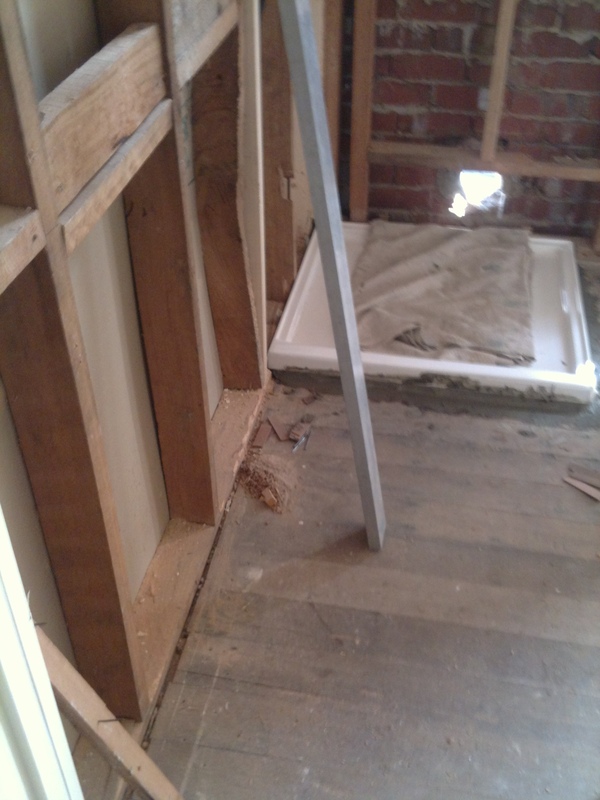 Mind you, it’s quite extensive; some of the wood that came out of the bathroom literally crumbled into dust. They’re very skilled nibblers, those pesky beetles. So I do hope that we got the correct advice. The whole point of this home makeover exercise is so I can more comfortably rent out a room. I don’t want to have to advertise a gorgeous two-bed, two-bath unit complete with adorable cocker spaniel, resident beetle population and structurally weakened timbers. 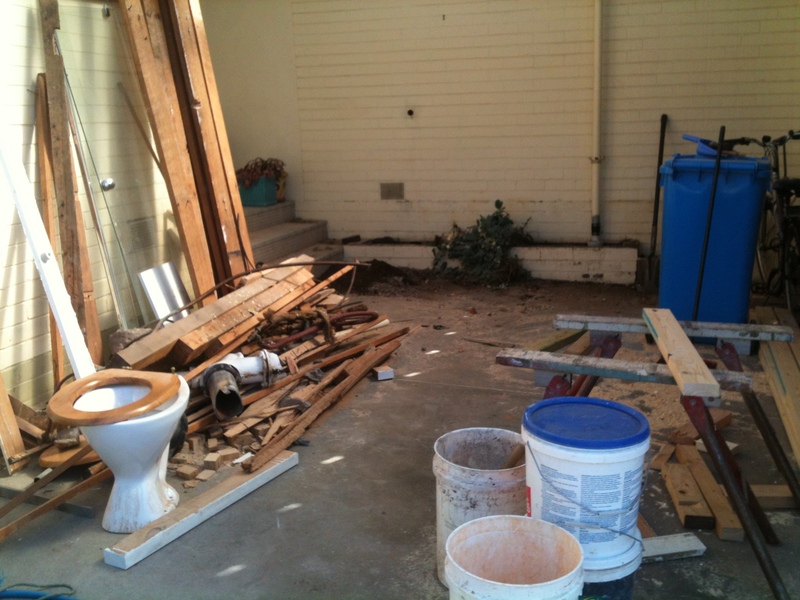 The demolition phase – one bathroom, one laundry and one powder room – took about two days apparently. That’s the easy bit. It’s going to take a while for them to fill in all the gaps and create my en-suite, the tiny guest bathroom (think train compartment) and the new laundry. 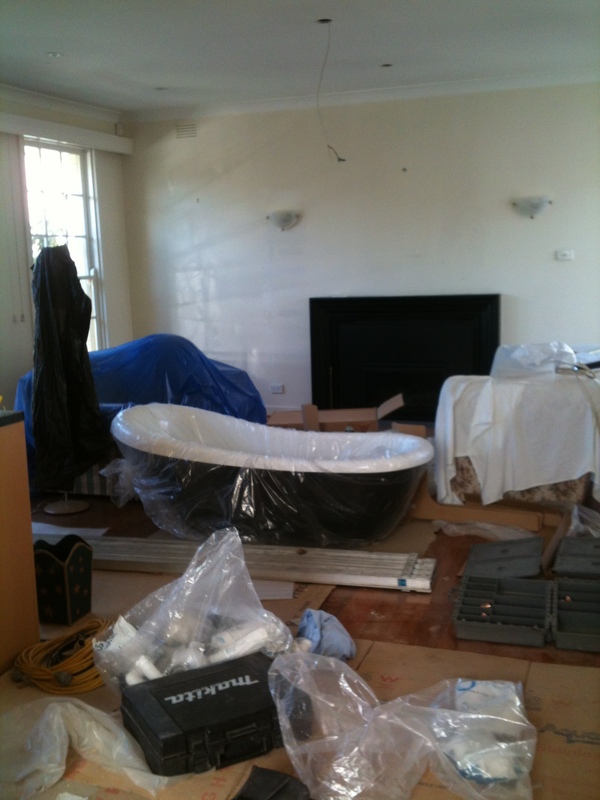 And there’s work happening in the kitchen and living room too. As you can imagine, the whole place is covered in dust and debris. My neighbour is right: I am very lucky to be enjoying a temporary sea change down in Anglesea. Guest bathroom in the making. Size doesn’t have to matter. The house is one street back from the ‘back beach’ where the waves pound and roar (you can hear the sea lying in bed) and the light shifts and changes minute by minute. But, bliss comes with caveats or I am being Goldlockian again? When I was clearing out my house and running up and down stepladders all day long, I longed for the peace and quiet of Anglesea. But when I finally got here, I didn’t quite know what to do with. I had a dose of the post-adrenal blues. I was tired and fidgety and instead of going flop for a few days, only gave myself one day off. Maybe it was because it was so quiet that I felt I had to fill in the gaps. And, just to keep me on my toes, I got two writing commissions, one on Indigenous Health and one on Corporate Volunteering. Both are right up my alley but pinning down willing interviewees proved less easy, so I become even more fidgety. But then, thank Goodness, something shifted when I returned from my 24-hour trip to Melbourne. I realised that it’s simply a case of allowing myself to make the most of the less hectic pace here and to re-charge my batteries. Because once I return to my house, I am going to need lots of energy to clean up and put it all back together. So, yesterday, I ditched the keyboard, had a cup of chai latte in a cafe and then walked Bertie by the river. After a day of non-stop rain the sun came out as did the birds and the butterflies. And the air had that wonderful post-rain woodiness and freshness. I noticed the quiet flow of the river compared to the pounding of the ocean. It was as soothing as the cup of chai latte. I’ve got friends coming to stay this weekend and we’re going to Lorne to check out the Sculpture Biennale, where more than 40 works of sculpture are dotted along the shoreline from Lorne Pier to the Erskine River. What’s more we can take Bertie – it’ll be good for him to discover his inner artiste rather than his innate glutton! There are lots of delights down here – and I haven’t even started on my favourite cafes or the fabulous book shop at Aireys Inlet. I’ll leave those for another blog post. Meanwhile – and wish me luck – I have signed up to a Zumba class on Wednesday night. I thought it would be a good way to meet the locals and have a laugh. Or discover I have two left feet. Time will tell.